What's more dreadful than a werewolf curse? Finding the ingredients of the cure! The legendary adventurer Saberman has fallen prey to a werewolf curse, and he has 40 days and nights to find a way to lift the curse before it becomes permanent! His research has led him to Knight Lore castle, home to Melkhior, a dying wizard. Melkhior has vowed to rid Saberman of his curse, but he is too weak to gather the ingredients of the cure, which are scattered all over his castle. 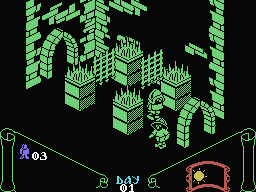 As Saberman, you must explore Knight Lore castle, collect the required ingredients and bring them to the wizard. This wouldn't be so hard if the castle wasn't filled with traps and dangerous creatures that kill with a mere touch! You will need acute skills and intellect to stay out of harm's way and solve some intricate puzzles. Without your help, Saberman is doomed! Have you ever had a mysterious guy leave a nice present on your doorstep? This is exactly what happened to me with this game. 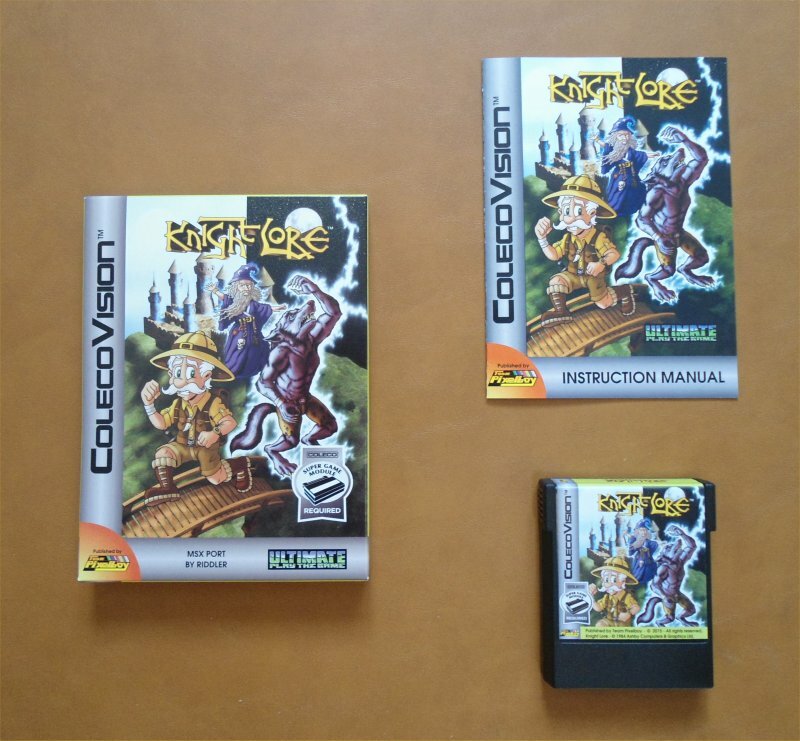 I never openly voiced my desire to publish a ColecoVision edition of Knight Lore, yet this port of the MSX version landed in my mailbox one day in April 2015. The homebrew coder asked to remain anonymous and to be credited for the port under the name "Riddler". He told me this would be is only contribution to the ColecoVision homebrew scene, and he wanted his port to be published by Team Pixelboy and no one else. Talk about good karma, eh? 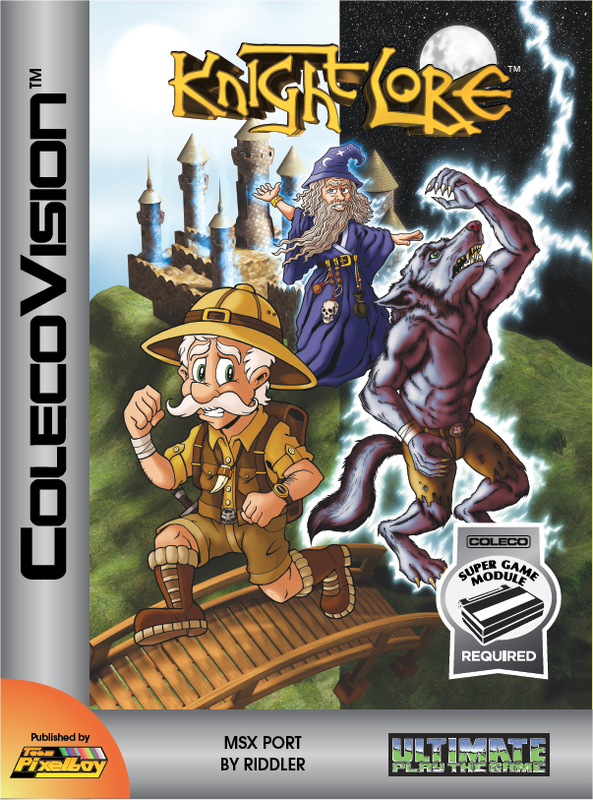 I've always wanted to publish an isometric game on the ColecoVision, so to me, this is like a gift from heaven. I don't know how Riddler acquired the technical documentation of the Super Game Module, but anyway, the game requires the SGM to function on the ColecoVision. 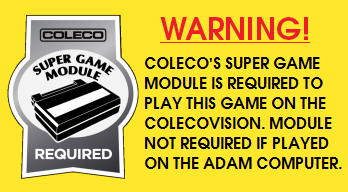 On the other hand, the SGM is NOT required if the game is played on the ADAM computer. Riddler told me that the game actually uses the sound chip in the SGM if it's present, otherwise the native ColecoVision sound chip is used. Not only that, but he added a nice animated title screen, and made everything fit in 32K! That's really impressive, and I'm proud to be the one to publish this great game! Here is a YouTube video of the MSX version of Knight Lore. The ColecoVision version looks, sounds and plays the same as what you see below.